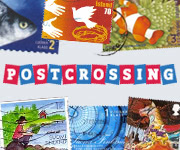 Postcrossing is a free system for helping strangers exchange postcards. 1. You register with the site. 2. Then you request an address to send a postcard to. 3. The site gives you someone’s address and a postcard ID number. 4. You write and mail the postcard, with the ID number on it. 5. The person who receives the card enters your ID on the website, which is proof that you sent a card. 6. Then your address is given to the next person who requests an address, so you should receive a postcard soon. (Many people privately send a postcard back to the person who sent them one, but the official Postcrossing system keeps things fair.) By trading postcards in English with people from all over the world, you get practice reading and writing. You might even make some friends. It sounds confusing, but it’s very easy when you register. Just follow the instructions. Some people have scanned and uploaded the images from the postcards they’ve received on Flickr. It’s free to register, but of course you’ll have to pay for postage. I’ll have to see if I have any international postcard stamps! Edited to be easier to read, and statistics updated, on January 26, 2010. First, I need to apologize for not posting often enough. I’m trying to finish my master’s thesis, and I only have two weeks left! I hope that by mid-June I’ll be less busy and I can pay more attention to Readable. Previously, I posted about Learning Resources, a great site featuring news articles. Unfortunately, it hasn’t been updated in over a year. It’s still worth using, but there isn’t anything new being added to it. A different website that you can try, which is still being updated frequently, is Breaking News English Lessons. This site is aimed at English teachers, but you can use it yourself (for free!). Find an interesting topic under “Latest Lesson” or “Recent Lessons.” Every lesson page includes a fact-based news story, an mp3 of the story being read out loud, activities, and quizzes. You can do the quizzes yourself, and if you have friends who are also studying English, you could even do some of the group activities together. (Answers are included at the bottom of each page.) The author of the site has chosen a wide range of article topics: the current list includes endangered tigers in India, politics in Britain, cars, and more. I hope you can find several stories you’re interested in. 1. Firefox is safer and more reliable. The internet is full of misleading websites that can infect your computer with viruses and worse. Firefox will protect your computer better than Internet Explorer can. Firefox also crashes less often. 2. Firefox handles non-English languages well, so it’s a better choice for multilingual people who may view e-mail and websites in several languages every day. For example, it handles Unicode much better than Internet Explorer does. In addition, you can download Firefox in many different languages. 3. Firefox is free, independent, and open source (read about the open source movement in Japanese, Chinese, Korean, Spanish, etc.). It runs on MacOS, Windows, and Linux. If you are concerned about the negative impacts of globalization, consider using Firefox and other open source programs instead of those from companies such as Microsoft. 4. Firefox has lots of free, useful “add-ons” to help you organize your learning and find new ways to learn. The add-ons can be installed by just clicking the green Install Now button. Very easy! Here are two that I especially like. You will have to get a free account with each service to use it, but that is also easy. StumbleUpon lets you share and discover sites on topics you’re interested in with other users all over the world. I’ve discovered some excellent English-learning resources there. 5. Firefox has lots of free, useful “add-ons” especially for language learners and multi-lingual people. This page contains all Firefox language and translation add-ons. (I haven’t tried all of these.) GTranslate will translate English into other languages when you highlight a word or phrase. Converter will convert time-zones and measurements. FoxLingo, Translator, and several others will translate an entire webpage. Although you shouldn’t rely on auto-translation too much, it can be useful in many situations. Right now, some of my students are using Dictionary ToolTip, which displays an English<->English definition after you double-click on any word on a webpage. It’s really good practice for them when they find difficult words, because the explanation is given in English too. If you try any of the other add-ons, please add a review on the Firefox site for other users to read. If you find a really good one, tell me about it and I’ll write about it in the future. Note: I don’t advise deleting IE, because a few websites will only work in IE. I keep an old copy around for those times, but Firefox is my default browser. Click the button to get Firefox! The Hugo Awards are given annually for outstanding works of science fiction and fantasy. Recently, many of the works that have been nominated are put online so that the voters can easily read them. They may not be online for a long time, so they’re worth reading now. Because they’re high-level, literary science fiction, some of the stories are very difficult to read. But here’s one you might like: “Impossible Dreams” by Tim Pratt is a wonderful story for fans of classic American films. If you’re a movie-lover, try this story. I haven’t had time to read any of the novellas or novelettes, but if you would like to recommend one that advanced English learners could read, please do. On Thursday, I’m flying to San Diego to attend the statewide conference for CATESOL. My classmate and I are going to give a presentation about using Japanese comic books to teach English. It should be fun! I’m also going to attend lots of other presentations. I’ll probably be too busy to post here. However, I expect that I will come back with lots of new things to write about. In the meantime, here is a long-time favorite self-study site: Interesting Things for ESL Students (also called “Many Things”). There is so much here that you could spend months using it. There are word games, quizzes, explanations, idioms, jokes, poems, songs, drills, and a lot more. Let me know what your favorite pages at Many Things are. There are so many pages, I can’t try them all. Have a good week! I’ll be back in just a few days. StoryCorps is an interesting project to record ordinary Americans’ stories. There are booths in various parts of the USA, and people go in to talk about their family or personal histories. Of course, this means there are lots of different accents for you to listen to. There will probably also be a lot of slang and colloquialisms, so take your time finding an interesting story that’s understandable. It’s a good way to practice listening to ordinary, everyday English as spoken in the USA by a variety of Americans, including those who were born in other countries. You’ll also learn about people’s lives and American culture. You can even subscribe to the free podcast, which can be downloaded onto your mp3 player or hard drive. If you try listening to these stories, tell me about it. Does anything surprise you about the way people talk or what they say? Are they easy to understand? Which stories are the most interesting? All three are free, though you need to register. You don’t have to draw anything, just click and drag! StripGenerator and ToonDoo let you choose from their graphics to tell your story. Comeeko lets you use photos from your digital camera.